SCWO, together with Deloitte Japan, was honoured to co-host a networking dinner for the Tokyo delegates from the Acceleration Program Tokyo for Women (APT Women). 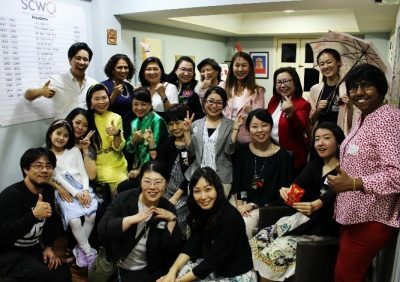 The APT is a program supported by the Tokyo Metropolitan Government that aims to help women CEOs develop their business for international expansion; create a network of women entrepreneurs and mentors and foster public attention of Japanese female entrepreneurs. Delegates from the program were in Singapore as part of the overseas dispatch portion of the program to widen their reach by connecting with other women entrepreneurs, business partners and corporate supporters. They were joined at the dinner by representatives from SCWO’s member organisations such as Bloomberg Women’s Community, Mums @ Work, NTUC WAF, PA WIN, PrimeTime, SBPWA- Third Chapter, SBPWA-Main Chapter, SBPWA-Mandarin Chapter, Shell Singapore Network of Women, Young Women’s Leadership Connection and ZONTA Club. SCWO President Dr June Goh welcomed attendees, while 1st Vice-President Ms. Junie Foo addressed the attendees in fluent Japanese. This was followed by a sharing from the APT team. 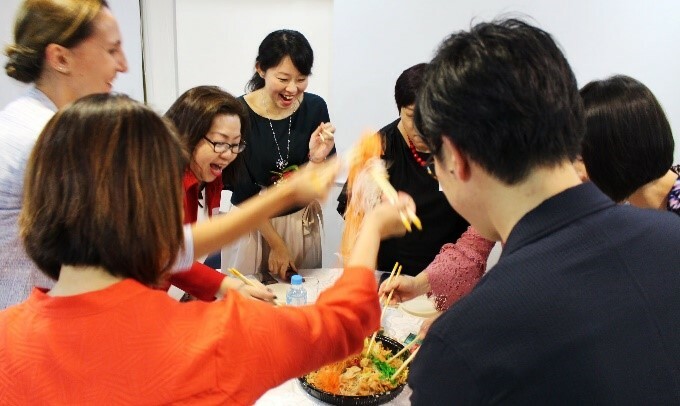 Attendees then enjoyed a delightful dinner, and a boisterous tossing of the Yu Sheng, in celebration of the upcoming Lunar New Year.